Only Jet Ski Tour in Key West That Gives You 20 Minutes of Free Ride Time! 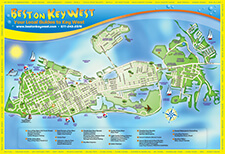 Are you ready for a fast-paced, exciting tour around Key West? Best on Key West offers our Jet Ski Island Tour for those who want a little more action and adventure on the water. This 26-mile, guided tour is fun for everyone, so bring your friends, your family, co-workers and colleagues for a nearly 2-hour tour you won’t soon forget. The Jet Ski Island Tour is the perfect way to see the whole island in one go, exploring every nook and cranny while taking in the warm sun, crystal blue waters, amazing tropical wildlife and the historic and popular tourist attractions on the island. This tour really provides it all. Enjoy some free-riding time on the Gulf of Mexico side of the island as you zip across the water on reliable and speedy Yamaha waverunners. Catch sights of Fort Zachary Taylor, Mallory Square, the Navy Mole, Southernmost Point and more as your guide leads you on your amazing adventure. You’ll also head into the backcountry where you can see Florida wildlife in a natural habitat while exploring the mangroves. And don’t miss out on stopping around the sandbar and Boca Chica Beach to bask in the sun or play in the shallow waters surrounding the sandbar and see how many starfish you can find. Each tour is slightly modified depending on winds and weather. We all have an adventurer in us waiting to get out. The Island Tour lets you do just that, have an adventure at your own pace. Although the tour is guided, you can follow at your own pace, something none of our other tours offer. Skip the crowded boats and hop on your own waverunner. For the safety of our Island Tour passengers, those who plan to operate a waverunner and were born in 1988 or later must complete a Florida Boaters Safety test. Please provide a valid driver’s license and credit card, and arrive 45-60 minutes prior to departure to complete the test, which costs an additional $3 cash fee. What is required at time of check in? Check in is 30-45 minutes before the tour begins. Any person born in 1988 or later MUST CHECK-IN 45 MINUTES PRIOR TO TOUR TIME in order to complete a Florida Boater's Safety test. More details will be available on your email confirmation. What is the boater's safety course? This is a mandatory safety course for jet ski drivers that are born in or after 1988 and do not have a boater's license. This will ensure that you know how to operate a jet ski safely during your tour. Is pick up and drop off available on this tour? Yes, there is complimentary pick up at no charge to you. This must be arranged at least 24 hours in advance, you will call the number provided in your email confirmation after booking for this. This tour lasts about 2 hours. In order to drive your own ski you must be at least 18 years old.